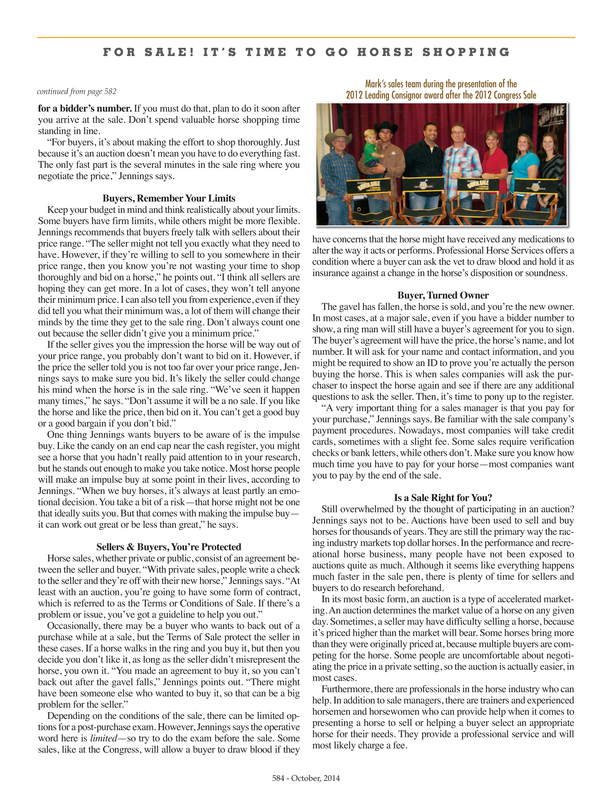 October means it’s time for the All American Quarter Horse Congress in Columbus, Ohio. It’s the mecca for anyone showing stock horse–thousands of people make the pilgrimage to the Ohio State Fairgrounds to show, shop, and just experience the world’s largest single-breed horse show. While working on another article for The Equine Chronicle, I met Russ Louderbeck, a hotel architect that lived approximately 30 minutes from me. He’s the owner of an up-and-coming Western pleasure stallion, Extremely Hot Chips, and I wanted to share their story. I came out to his farm, Louderbeck Ranch, and met him and the handsome dark brown boy. Not only did I get to know both parties, Russ invited me to take a few laps on his prized stallion–Are you kidding me!? I hadn’t swung my leg over a well-trained Western pleasure horse in years, and it was so much fun! It says a lot about Chip’s personality and attitude to come straight out his stall and allow a stranger to ride without much of a warm-up. 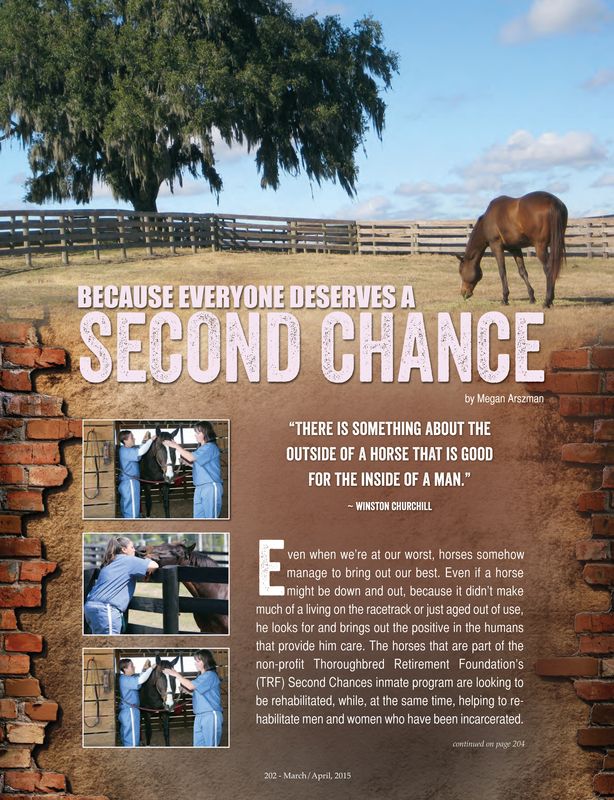 That’s why it’s fun to share this stallion’s story. Russ, a hobby horseman and breeder, will be showing Chip at Congress later this month in the Select Amateur Western Pleasure. Last year they finished in the Top 5, and he hopes to replicate, or do better, this year. All without campaigning or a professional trainer. Again, another testament to this wonderful stallion. Do You Really Need to Blanket? 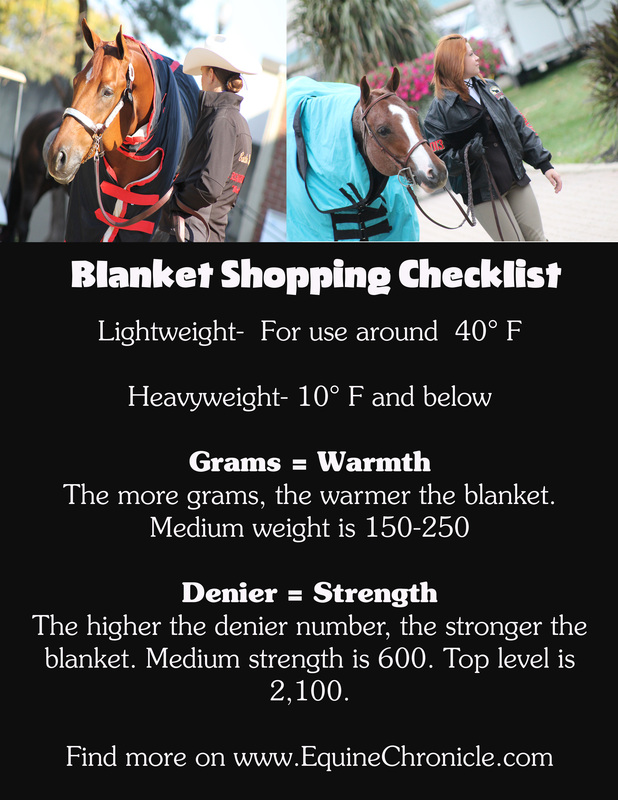 This is the first question you should ask yourself when it comes to choosing a blanket for your horse. If you’re not trying to keep a short show coat throughout the winter, and you’re planning to turn your horse out for a few months, experts suggest it’s best to let Mother Nature handle the insulation. Blanketing your horse can flatten his coat, which causes it to lose its ability to insulate. As long as your horse has shelter from the wind and proper nutrition, they should be fine throughout the winter without a blanket. However, if the temperature dips below 10° Fahrenheit, you might want to have a blanket on hand to help with extreme chill. As a new mom, I’m already learning the delicate balance you need to practice between your professional life and your home life. Last Fall I had the privilege of speaking with two women who seem to have figured it out, as they’ve grown successful medical careers while supporting their horse-crazy children. Being a doctor is a full-time job. It involves devoting your life to preserving the health and well-being of those around you. In the same respect, being a mother is a full-time job, as you devote your life to raising a child and helping him or her discover their own path. Put the two together and you have Mom, MD, someone who has learned how to juggle a high-demand career with the high-demand home life of being a mother. Not only is life busy at the hospital, and at home, but add in the hustle and bustle of a weekend at the horse show and you might get a taste of what life is like for Kelly Stille, PsyD., and Susan Urba, MD. Both women are doctors at the top of their respective fields and mothers of horse show kids competing at the highest level of competition. Dr. Susan Urba grew up in Chicago, far from the horse show world, and attended medical school at the University of Michigan in Ann Arbor. While in medical school, one of her rotations involved working with cancer patients. That experience inspired her to continue her study of medical oncology. “It’s an exciting field that looks into treatments for cancer, but you also get to look at other issues that cancer patients have, such as the need for emotional support and other related illnesses. It’s a broad spectrum,” she explains. Dr. Urba started doing a lot of clinical studies with esophageal cancer, but she has since moved onto developing more of a specialty with palliative care. Palliative care emphasizes pain and symptom management for cancer patients and, in some cases, it involves end-of-life care. At the University of Michigan, Dr. Urba has helped develop a program called the Symptom Management and Supportive Care Program within the Cancer Center. She works with cancer patients who have particularly difficult-to-manage symptoms or who struggle with serious decisions such as when it might be in the patient’s best interest to discontinue treatment that’s resulting in a poor quality of life. You can say that Dr. Stille is continuing the family business; she grew up with a mother who was a clinical psychologist. “While growing up, I was exposed to psychology by seeing my mom’s testing materials and learning how to conceptualize cases,” Dr. Stille explains. She also grew up showing horses, so she’s well aware of the demands it takes to be successful in the show pen. Because of her connections on the Paint Horse circuit, Dr. Stille attended college at Texas Christian University and then got her Masters and Doctorate in clinical psychology. During that time, she also married her husband and had three children, all while she was doing internships and her dissertation. She was still able to finish her degrees, including a postdoctorate in psycho-pharmacology while balancing raising three boys, two of which are twins Ryan and Austin Stille. For five years she has been running the neuropsychology program at John Peter Smith Hospital in the Level One Trauma Center in Fort Worth, Texas. 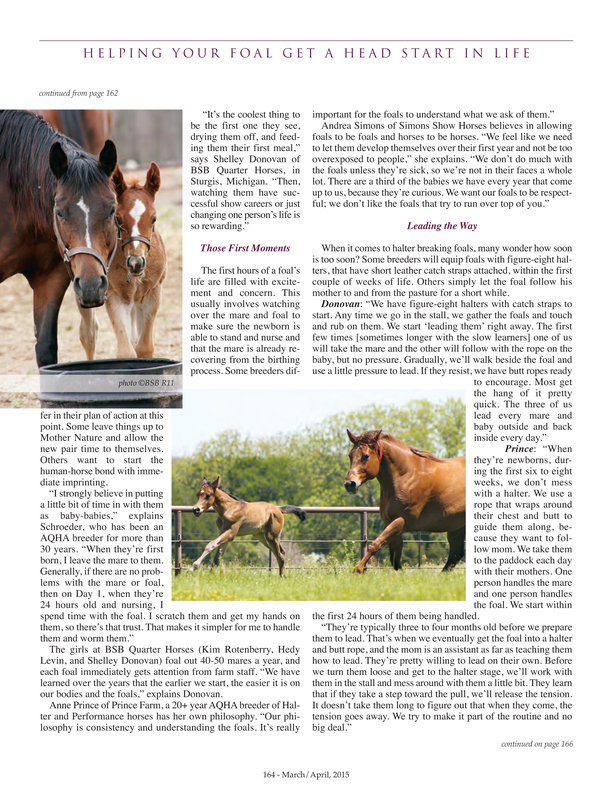 Read more from the November/December 2014 issue of The Equine Chronicle. One of my favorite things about living in Lexington is springtime–not just the new flowers and foliage blooming, or the excitement of Keeneland’s spring meet starting up, but seeing all the new foals sprinting and frolicking across their lush, green pastures along the roads. I seriously think the accident rate goes up in Lexington in the spring because of everyone gawking at the foals. 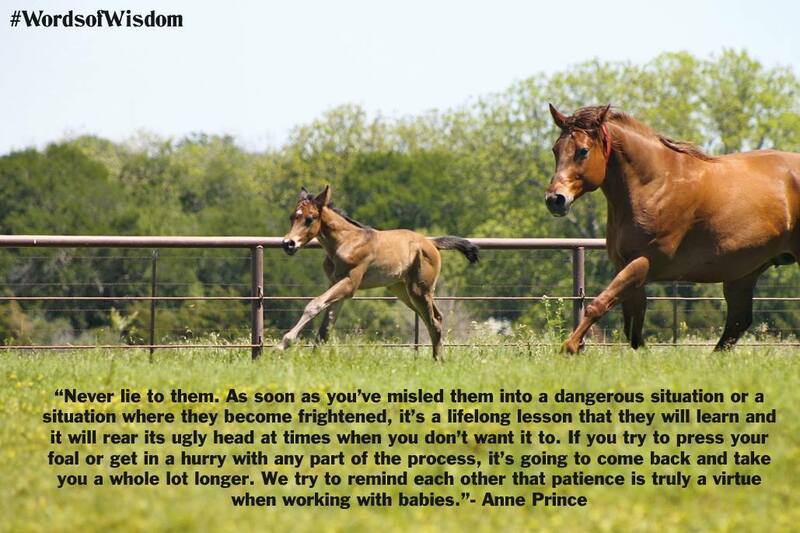 As a breeder, you want ensure that your foal(s) get the best start on their life so they’re stronger, healthier, and happier. There are so many factors for that first year of life: first veterinarian and farrier visits, first time wearing a halter, new humans, and, of course, weaning. 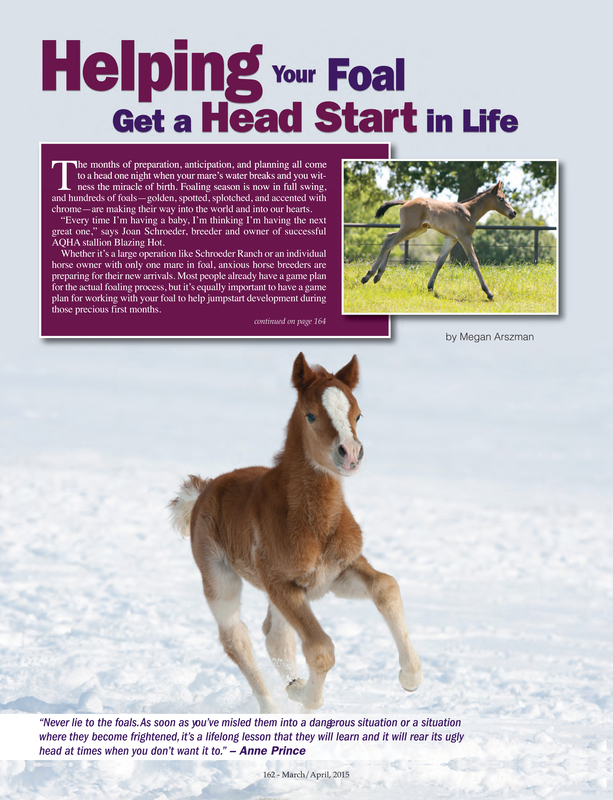 In the March/April issue of the Equine Chronicle, I spoke with seasoned breeders like Joan Schroeder (owner and breeder of AQHA stallion Blazing Hot), Shelley Donovan of BSB Quarter Horses, Anne Prince of Prince Farms, and Andrea Simons of Simons Performance Horses for how they help give foals a head start on life. 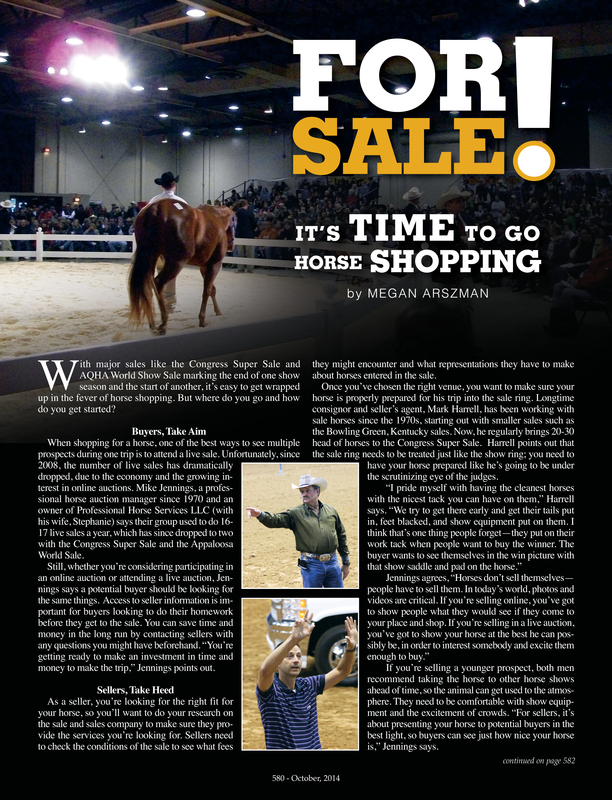 The winter months usually see an influx of horses for sale for multiple reasons–end of the show season, trying to shrink the number of stalls to care for in the winter, or just ready for something new. Not only are sales popular across the country, but the advent of online auctions is growing in popularity because of the ease of accessibility. 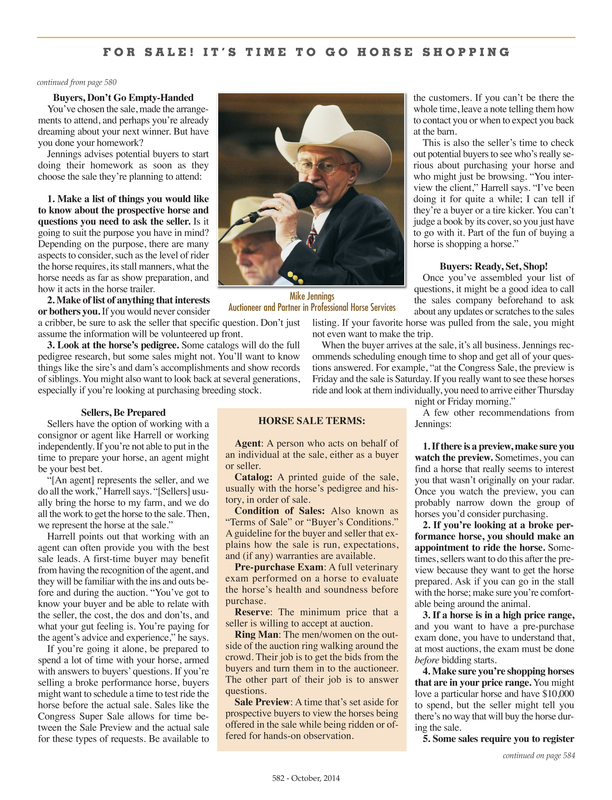 I worked with sales professionals and trainers to help you be more prepared to hit the sales ring/website whether you’re looking to buy that next World Champion or sell your project horse for the October 2014 Equine Chronicle.